Hot melt adhesive for sand cores and foundry systems. 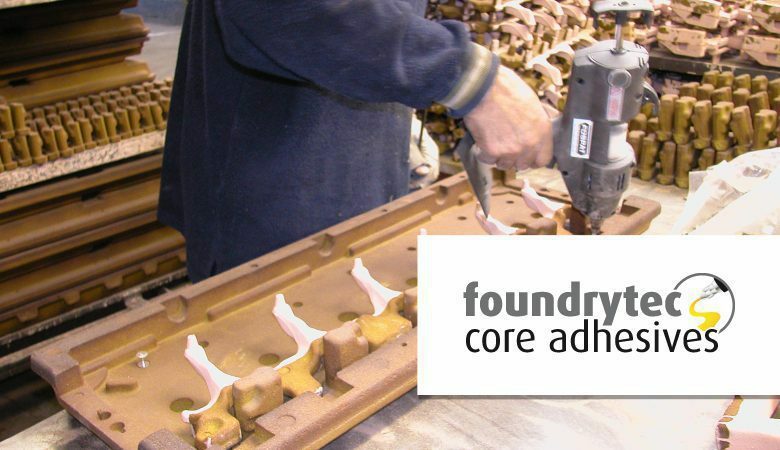 Power Adhesives offer a range of foundrytec hot melts suitable for most foundry systems, enabling foundries to speed up all aspects of core production. Foundrytec hot melt gives excellent adhesion where cold processes are used such as ‘Cold Box’, ‘Alpha Set’ and ‘Beta Set’. They can also be used on ‘Warm Box’, ‘Hot Box’ and ‘Shell’ but these have to cool before hotmelt application. Advantages of foundrytec over conventional fixing systems (such as water based glues) include increased production times, as there is no waiting for the bond to be made, and improved accuracy allows for less wasted time. The foundrytec hot melt adhesives have no shelf life, and therefore remove the risk of materials expiring and needing replacements. The risk of being exposed to harmful gasses is reduced, adding an extra layer of safety to the operation, and the hot melts use no solvents unlike some water based adhesives.